In my never-ending quest to be the Nicest Mother On Earth, I took the teenager and three of his friends to Six Flags/Great Adventure last week – a destination I had hoped I would live my entire life without ever experiencing. Before leaving, I went on their website to get directions. I discovered that you could buy and print out discounted admission tickets online, saving $20 per person, as well as pre-purchasing parking and food vouchers. I passed on the food, but bought us all admission and parking, printed my directions, loaded up the car with boys and headed south. The entrance road to Great Adventure is clearly marked with signs and instructions every few feet. There’s a lot to read. That, along with being in completely unfamiliar territory, made me a little tense and when I’m tense I don’t like to read instructions, I like to talk to someone. Fortunately for me there was a gentleman not too far away wearing one of those orange and chartreuse reflective vests that let you know right away this is a person who is here to help. I was slowly approaching a giant line of toll-booths that all seemed to be labeled Credit Cards Only. I had no idea which line to get in, given that I’d already paid for my parking online. I yelled over to my vested friend, stating my predicament in a few short sentences. “Do I actually need to be in one of these lines?” I asked. “Yes, Ma’am. You need to be in a line. How is anyone going to know you paid already if you don’t show your voucher at the booth, Ma’am?” He had that same exhausted tone my son takes with me whenever I ask him a question. “He called you ‘Ma’am,’” said one of the boys. The boys all wanted to know why. So I told them the secret of ‘Ma’am.’ My contempt for that term is not really due to what Natalie Angiers refers to in her New York Times piece today: that the honorific implies a middle-aged dowdiness (although it does). I was very pleased with myself, imparting this bit of wisdom. It’s not often that I can be the successful purveyor of life lessons to my own kids, let alone a car full of teenage boys. I could tell by their small grunts of acknowledgment, the heads nodding in the rear view mirror, that they really heard me – really got what I was saying. It was confirmed all the more as we made our way through the park, and for the next six hours, my four teenage charges managed to “Ma’am” and “Sir” every living soul they encountered. Yesterday I lost three things and I found two. Well, I didn’t really lose them all yesterday. Yesterday was just the day I started a running list of all the things I couldn’t find. The first was not that important. It was my neighbor’s house key, which is usually in the little cup in the cupboard with all my other neighbors’ house keys. My neighbor asked me to walk her dog in the afternoon and she said, “you have the key, don’t you?” I’d answered before I looked. But she always keeps a spare key hidden at her house, so the dog got walked and I was simply left with a key mystery. Then I was looking for the phone charger. It was in a plastic ziplock bag along with the car charger and I hadn’t seen it in since we got back from vacation. It’s a charger to an old phone, one that I’d bought a temporary usage plan for while we were at the beach, and now that old phone needed a charge. I was looking in earnest for the phone charger when it dawned on me that another thing was lost, too, but I couldn’t remember what it was. Oh yeah, my neighbor’s house key. I’ll look for both. “The other thing that’s missing is the Kindle power cord,” said my husband when I asked if he had the neighbor’s key. He bought me a Kindle for my birthday and I’m sure I’ll like it someday but right now I have no interest in it. I already own my next four books as (what do you call real books now?) "corporal entities," so it’s going to be a while before I can delve into a book electronically. The power cord was on the coffee table since I’d opened the Kindle box, so we quickly blamed the cleaning woman for its disappearance and assumed it would never be seen again. A day passed and I still couldn’t find the phone charger. I began to curse the amount of “things” we have, always assuming that if we simply had less stuff, everything would be easier to keep track of. “What were the other two things I was looking for?” I asked my husband. “All I can remember is the Kindle cord,” he said. I found the Kindle wire in the kitchen drawer. The one where I keep all my “charging wires.” I discovered it when I went in there to get my charger for my cell phone. Guess what else was in there? The ziplock with the other phone charger. What is wrong with my brain that I didn’t even consider looking in the Charging Wire Drawer for the missing charging wires? Neighbor’s house key: still at large. I went to the pharmacy today and on the counter was a little display container for Snickers bars. I love Snickers. Not as much as M&Ms, which I had a passionate conversation with Nancy about yesterday (during which she defended both the advent of Blue M&Ms and Pretzel M&Ms, two positions which I warned her might jeopardize our friendship). But if I were going to blow an entire day’s worth of Weight Watchers points on candy, and M&Ms were unavailable, Snickers would be my second choice. Why? I would have to say it’s unequivocally the nougat. I’m not certain what nougat is beyond sheer caramelly goodness, but it sure does resonate with my tastebuds and is well worth the immediate after-effect of having my teeth feel like they’re covered in fur. So I did give that counter display more than just a furtive glance. I knew I wasn’t going to buy a Snickers bar, but I just wanted to rest my eyes upon the logo-type and have a small, private moment fantasizing about its chocolatey chewiness. 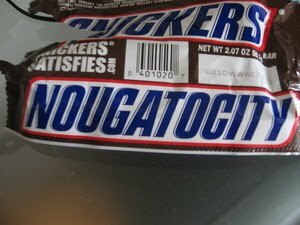 NOUGATOCITY. That’s what the logotype read. Huh? Am I hallucinating? Nope. Some genius coined this word and talked the appropriate Mars Brand Manager to print it on the backside of the candy bar. I love when big package-goods companies have fun with language. Like the time I was waiting for my son to come out of Lacrosse practice and out of sheer boredom I started reading the package copy on the bottle of Kiwi-Strawberry Vitamin Water that was sitting beside me in the cup-holder. It was a whole paragraph about a study that had been done which demonstrated that people didn’t need the letters of a word in the right order to be able to read it. Just the first and last letters of the word had to be correct. Everything in between can be willy-nilly, and to prove it, they wrote this assertion in just that manner. If I wasn’t a die-hard Vitamin Water fan before, I became one then. It doesn’t take more than a little effort (and a lot of courage) to add some whimsy to your product packaging. That Snickers bar logo made me smile for half an hour. But, that’s me. Word nerd. In 1991 I drank several cups of coffee a day. It was my breakfast, lunch and afternoon snack. Often I didn’t eat solid food at all until after 2PM. My coffee needed to be prepared just so, with real sugar and a generous amount of half-and-half. Enough half-and-half to turn the black coffee a lovely camelhair beige. I would only drink it out of a white mug, in order to make sure it was exactly the right hue. Those cups of coffee, taken in alongside cigarettes, were about as close to heaven on earth as I ever hoped to come. Quitting coffee was a grim endeavor. It took me months before I could stay awake beyond three in the afternoon. My body was not used to relying on its own energy source and the caffeine withdrawal was long and arduous. But then, after those first few months, I found my own life energy and lived a productive and perhaps less agitated life. Living caffeine free (no coffee, no chocolate, no coke) left me feeling healthy and virtuous, although my back pain didn’t go away. But I ultimately decided to stay off coffee because, mostly, I felt better. When I started Weight Watchers two years ago, I quickly discovered that my daily cup of decaf was an enormous four-point indulgence. That’s how many points I had to give myself if my decaf was to turn the appropriate shade of beige. So I gave it up completely, opting for solid, chewable points instead. Then I discovered fat-free half-and-half. No points. A teaspoon of sugar is only one point. So some days – on special occasions – I might treat myself to a cup of decaf just for fun. That was the case last night around 9PM, after grocery shopping, a few points to spare for the day, I decided to sit down at my desk with a nice cup of decaf and organize my papers. I’d made a bit of decaf earlier in the week, so the coffee maker was already out. I pulled the Chock Full O Nuts out of the fridge and prepared to scoop. Hmmm. Where’s the little red measuring spoon that’s always in here, I wondered as I pulled back the can’s yellow plastic lid. That’s really odd, I said out loud as I looked in the drawer for another measuring spoon. Oh, well. Whatever. I scooped, brewed, sugared and drank. Yum. At 11:30 PM I was meticulously uploading vacation photos to Facebook. Tagging. Captioning. How odd that I was so tired at 10 oclock last night. I could go on like this for hours. I finally went to bed at midnight (late for me) and was up two hours later raring to go. I had a lot of thoughts swimming in my mind and considered that if I wrote them down maybe I could settle back to sleep. No. Still up at 3. Still up at 3:45. My husband used to call this phenomenon “missing the sleep train.” The way you sometimes can’t fall back asleep and have to just lay in bed, like you’re waiting at a train station, an hour, an hour and a half, and when the train shows up, then and only then are you able to again drift off. But this felt different than missing the sleep train. This felt like there was never going to be another train at this station again. Like they discontinued the line completely and soon the station will be full of graffiti and soon after that it will collapse in decay. And that’s when it occurred to me that perhaps what I drank at 9PM was not decaf after all. A quick 4 AM trip to the kitchen confirmed my suspicion. My little lost red coffee scoop was nestled right where it always is: in the green-lidded Chock Full O Nuts. The one way at the back of the fridge. By 6AM I was back on the sleep train. Just in time to wake up at 7 to take my son to Cross Country practice. The actual day – my Friday the 13th birthday – was spent exactly as I had hoped, quietly, under the radar, no pomp whatsoever. I woke up early and cleaned our beach house for our mandatory 11 a.m. departure. Laundry, sweeping, throwing food down the drain. Activities that were comfortable and familiar – and that I didn’t need to dress for. I drove half our posse home, my brother drove the other half. Then, a few hours later, I drove him and my niece and nephew to the airport. On the way home I stopped at a bike shop to pick up a gel-filled seat-cover that I can put on the bikes that I ride during my spin classes. I’ve been going for about 9 months without, but I tried one once and it really did make the experience (and my keister) a whole lot happier. I brought the seat cover to the register and, on a lark, told the young man at the register it was my birthday. “It’s my birthday today. Do I get a birthday discount?” This is exactly the sort of ballsy, obnoxious thing I used to do in my twenties and I was a little surprised to hear the words come out of my mouth these many decades later. “Why not?” They asked my name. Then they serenaded me. When I got home, I sat down to read and one of my besties showed up with a big pink shopping bag. “It’s silly and frivolous,” she said (which is always a good choice for me). Inside was a Barbie – a new-fangled, B-cup, little-black-dressed Barbie with a bit too much smoky eye shadow and a Jennifer Anniston hair-do. Her hips are smaller than I ever remembered them being. Ditto her breasts. Finally, at 50, I can relate to her. I really love Barbies, in a way I can’t explain and don’t even care to try. This one came with a lot of very fashionable shoes and accessories and now sits next to my computer to keep me company. I took a long walk. I ate healthy food. I took a hot shower. And I gave a big boatload of thanks that I have been able to come this far with the good fortune I have been given. I was going to be fifty at the end of the week, that’s why I tried on the bikini. We were at the beach that week – me, my husband, my kids, my mother, my brother, his kids. My brother lives on the other side of the continent, so we don’t get together very often. He’s big and has a penchant for picking me up and flinging me around when we see each other. He plasters me with cheek kisses. “You look good, Jes,” he always says. “Good enough to wear a bikini?” I asked him as we’re hauling beach chairs down the dunes. The question seemed to come out of nowhere. It startled me as is passed my lips. “If not now, when?” he said. Thus the seed was planted. Later that day, my husband and I drove up to the video store to return movies and on the way decided to stop into my favorite five and dime on the north end of Long Beach Island. I’d been here days before and fallen in like with a hot pink tote that had “LOVE” patches on the pockets. I assumed this was the extent and caliber of my mid-life crisis. My mom was with us and she didn’t want to come into the store, so we left her in the car with the AC running and popped in to pick up my tote. I also had fallen in like with a cute little purse and a pair of cheap sunglasses. My husband considers me difficult to shop for, so when I find something I like he tries to take advantage of it. I showed him the tote and I showed him the little purse and I had to try on seventeen pair of sunglasses to make sure that the pair I was pointing him towards was exactly the right one. Oh, look at that cute scarf with the peace signs! Maybe I need that, too. As he hauled that whole bundle of groovy stuff up to the cashier, I slipped away. I moved tentatively toward the bikini rack and took a deep breath before I actually touched one. I hadn’t tried on a bikini since the Carter administration. This particular specimen was pale pink with broad white stripes and looked cute from a distance…not so much up close. The five suits next to it were just plain ugly. In fact, there wasn’t a single pattern I was drawn to, but for one: a soft lime bikini with small white polka dots. I pulled it off the rack and it was still cute. So I snuck into the dressing room in the same stealthy manner I skim off layers of Vanilla Haagen Dazs before bed. I took off my clothes fast, before I could talk myself out of what I was about to do, and just as quickly pulled on the bikini bottom. The top was just a couple of triangles and some string – a contraption I used to be adept at assembling when I was a teenager, but which now felt foreign and complex. It fit. But that’s about all I could say about it. My bikini-wearing question had been answered. And the answer was no. It’s a totally different occurrence trying on a bikini at 50 and being disappointed in the way you look. It is not nearly the suicidal experience it is at 20. And not once did the thought of skipping meals as penance cross my mind. So I put my lime green friend back on the rack and met my husband at the front of the store and we climbed into the car to get on with our movie returning. I turned the key and the car did not start. It made a weird thwaking sound that I imitated for my mechanic over the phone and he made the long-distance diagnosis (just like the Car Talk guys): dead battery. I thought I'd left the car running for my mom, but I guess I hadn’t. I guess I’d just clicked on the ignition switch enough to run the air conditioner. It’s just like me to think that my car battery died in response to my doing something as impetuous as baring my midriff. Of course, rationally, I know that’s not the case at all. But there is this feeling that I carry around with me lately – an unfamiliar combination of bravery and curiosity that sometimes feels close to recklessness. As if the little voices in my head that have kept me in check all these years are starting to yawn and lie back in their hammocks. Bigger thwarting mechanisms now need to take over. I found someone with jumper cables and within a few minutes we were back on the road again. But I was nervous to turn the car off, even after the battery had recharged. Even after I was back in my safe world of returning movies and picking up groceries, my torso happily tee shirt clad again. It felt somehow like a little something had been undone that day, and I’m not quite sure if there’s any way to take it back. My husband and I have just finished a DIY project. It’s 9:07 PM. We started it about 10:30 this morning. The task was simply to build a three-drawer cabinet from IKEA for our new bathroom. My husband and I have had some of our biggest fights during DIY projects. Which is why, mostly, we let others DI. I usually show up to the task already stressed out, fully expecting something major to go awry. I was in the kitchen as Scott and my son were opening up the boxes. I heard them saying something about the instructions being all in pictures, like Lego manuals. Of course I thought they were joking. Who could expect someone to put together a complex piece of furniture without using any words? Well, apparently the Swedes do. Because there was not one single character in that whole multi-page booklet. The closest thing was a question mark, which was immediately followed by a line-drawn man talking on the phone to IKEA. Ok. The word IKEA was in there. The reason that the project took 11 hours was not from sheer ineptitude. Those 11 hours included one trip to Home Depot to buy drawer pulls (because this three-drawer cabinet is not sold with drawer pulls). I had hoped also to find an exact match for the four screws that were missing from the hardware packet, but Home Depot, despite the fact that it’s the size of a small town, did not carry that particular screw. We were not able to go back to the IKEA we’d purchased from because that IKEA is in Bergen County, the only subsection of New Jersey still enforcing blue laws – in this case, Sunday Closing laws – that prohibit the sale of electronics, clothing and furniture on Sundays. So we instead trekked to Elizabeth, an IKEA I’ve been to only once and then at great peril since no one in New Jersey has a whit of patience for someone who doesn’t know her way around those loopy, confounding roads off the Turnpike. The 11 hours included taking a number at IKEA – as if at a deli counter – and waiting for 30 minutes for someone to call 636 so I could get my four screws. It also included the time that I paced up and down the cinnamon bun department, trying to get Scott on the phone to tell him that he and my son could leave the showroom and come meet me now because my mission had been accomplished. It included the time I wandered outside, hoping that somehow the fresh air would prevent my calls from going straight to Scott’s voicemail. Or that it would enable us to hear each other during one of the times he called me. But the fresh air assisted in neither of those endeavors, so I just made my way to the main entrance and admired women’s saris until the rest of my family emerged. Screws and drawer pulls secured, we headed back home but by that time we all required sustenance. This would have been easily accomplished if I’d gone to the supermarket yesterday, when it was on my To Do list. But I frittered the day away working, so we had no rations whatsoever. Consequently, the 11 hours also included my trip to the supermarket, unpacking groceries, and Scott’s frying up some vittles. It also included a low point, early on, when I snapped at my young son needlessly, telling him how angry I was apt to be if he broke the piece of our project that he was holding at the time. It included his brooding time, my apology time, and the entirety of his silent treatment, during which I spent little time assembling and lots of time vacillating between self-righteousness and shame. So, now we have a three-drawer cabinet for our bathroom. And I’m waiting for that sense of accomplishment to well up inside me. I'm too tired to post a picture of it. Too tired, even, to end this post properly. I'm just going to drop it here and go to bed.